In some parts of the UK (especially in parts of London, home counties towns such as Beaconsfield, Harpenden, Amersham & St. Albans, and even further North in Harrogate, parts of Cheshire, North Leeds and South Manchester) where property values are at a premium and stamp duty is high, many people are turning to basement conversions and basement extensions as a viable option. External light-wells in basement conversions and basement extensions can often be used as a means of escape. Courtyards can create a garden space, with glass bi-folds or sliding doors opening into it, if it’s possible to excavate around one side of the basement, or if the site levels lend themselves to this sort of thing. Borrowed light can also come from double height spaces or glazed floors or toughened glass panels within floors. Imagine a glass viewing panel in the centre of your kitchen, that you could look down into, in order to get a great view of your wine cellar below!! In a basement conversion / extension or new build, (depending on the site constraints), the basement can be designed to get light from either the front or back, or possibly the side. This could allow the positioning of living spaces adjacent to light with service spaces to the rear. Sun tunnels are another effective architectural feature which help to bring in natural light, as they use mirrors within the tunnel itself, in order to diffuse light into the basement space. It’s worth considering keeping the space as open as possible, with minimal structures like walls and partitions. If budget will allow, consider a glass staircase with glass balusters and treads, and open risers? Not only will this create a striking architectural statement, it will also help to ensure light is well distributed across the space. Rooms that can work well without natural light are cinemas, wine cellars, entertainment rooms or bathrooms. As you’d expect, one major disadvantage of going down into a basement can be the cost. However, in areas where building land is scarce and property values are high, as mentioned above, basements can work well, financially. If the property has an existing basement in your property, even if it is in a bad state of repair or with a low ceiling, it may well still be cheaper than a traditional new build house extension. Additionally, the construction process of a basement conversion or basement extension can be complex however, here at Mash Architecture, we have a great wealth of knowledge and experience of undertaking this sort of project. What type of architectural style is right for your project? 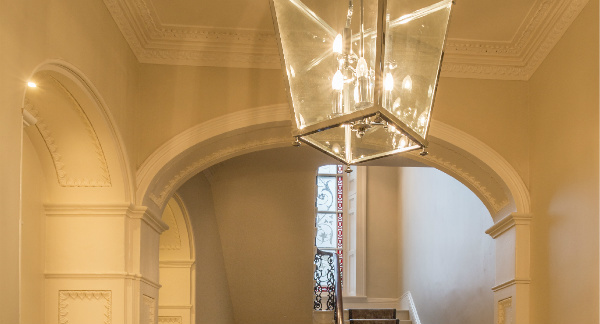 The hallway of a recent refurbishment which we undertook in Harrogate, North Yorkshire. However, the basement of this property was effectively a blank canvas and, as such, we converted it in a very contemporary architectural style, utilising features such as a steel staircase with oak-infill treads and glass balustrading, epoxy resin floor, a frameless glass screen leading to a wine cellar, and recessed floor-mounted uplights. A contemporary staircase, radiator and resin floor finish in a Harrogate basement conversion. With all the demands of modern lifestyles, basement conversions and extensions are increasingly being turned into leisure areas with pool or snooker tables, home gyms or even swimming pools and saunas. If you have luxurious tastes and a love of entertaining, basement rooms make excellent wine cellars. The relative quiet of a basement means it could make an ideal cinema room. Careful planning of the basement space is crucial to its success. 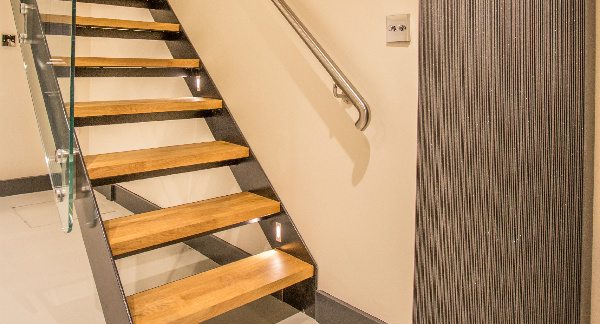 All too often basement rooms are lifeless areas, starved of natural light or key connection to the outside because the design hasn’t been properly considered, and this is where our expertise could prove invaluable. If you have a basement or cellar, and you would like to convert it into living accomodation, why not get in touch via our contact page? Mash Architecture can obtain all the necessary statutory approvals such as building regulations approval, or planning or listed building consent if required, as well as undertaking a full structural assessment, and helping invaluably with the design and planning of staircases, light-wells, planning of room layouts, introducing natural light, planning of bathrooms, drainage & structural solutions, damp proofing & tanking. We can resolve all these issues so that you don’t have to, taking the stress out of the whole process.